Regarded by some as one of Europe's best aviation events, 2016 saw the return of Airpower to the airshow calendar after a three-year absence. With strong support from the home team, and a reputation for attracting plenty of exciting European hardware, it seemed too good to miss. 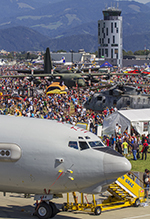 Peter Reoch travelled to Steiermark to report for UK Airshow Review. Photography by the author. 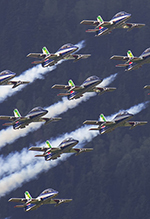 Perhaps it is the geography of Zeltweg that makes Airpower so popular with aviation enthusiasts and general public alike, with over 300,000 flocking to the Austrian air base for the show. The hills which surround the airfield form a natural amphitheatre in which some of the continent's best aircraft displays perform, providing stunning photographic opportunities for all. 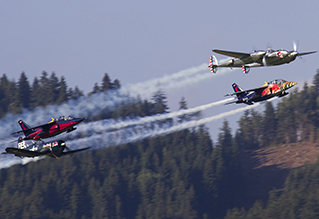 The planning of this mammoth event falls to three organisations; the Austrian Air Force, Red Bull & the tourism board of Steiermark, (the region of Austria which houses the show). 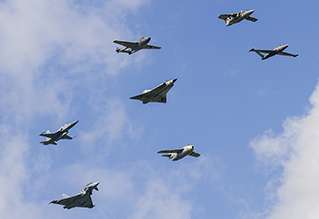 The role of each of their players was shown in a unique formation which opened the flying display at 8.45am on both of the public days with a Typhoon representing the Austrian Air Force, Alpha Jet representing Red Bull and a heart-shaped "Styria" balloon in the air together, presenting an interesting photo opportunity. The Red Bull involvement with the show didn't end there, with The Flying Bulls providing nearly their whole inventory of aircraft for inspection at the show. The star for many enthusiasts, and making its public debut, was the unique Bristol 171 Sycamore, adorned in its beautiful Royal Air Force Air Support Command colours. The helicopter was displayed in a brilliantly scripted pairs display, with a T28 Trojan performing gentle loops and rolls in the background. The Flying Bulls also displayed their TAH-1 Cobra & Bo-105 in a similar pairs display format, which held the attention of the crowd and was an innovative way to showcase less manoeuvrable aircraft, such as the Sycamore, without periods of quietness as they repositioned. The Flying Bulls also presented their P-38 Lighting, F4U Corsair & B-25J Mitchell, but added a pair of Alpha Jets to the equation, for a stunning display of mixed formation aerobatics. After a number of beautifully tight formation passes, the B-25J departed the formation, leaving the fourship to take centre stage with formation loops and rolls. Even the most veteran of enthusiasts were stunned to silence, such was the precision of the flying, with the Alpha Jets stuck perfectly to the wing of the Lightning/Corsair pair throughout. 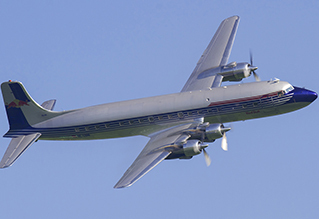 The Flying Bull's beautiful Douglas DC-6 also performed a short but sweet flying demonstration; opening with a stunning topside pass to keep the photographers in the crowd happy. As you would expect; the Austrian Air Force pulled out all the stops to showcase themselves to great effect during the airshow, with every single aircraft type in their inventory displayed in both the flying display and static display. 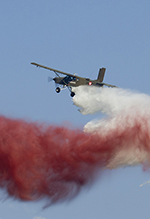 As well as the solo displays from their Pilatus PC-7 and SAAB 105, which are seen semi-regularly at airshows around Europe, the hosts put on a number of stunning set piece demonstrations to showcase their combat capabilities. 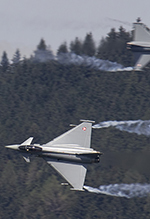 For most enthusiasts, it was the Austrian QRA & Air Combat demonstration which was the star of the show. From the get go with the pair launching from the runway to intercept the C-130K (playing the part of an unresponsive aircraft) the audience loved the spectacle of the Typhoon's sheer power and agility. Once the Hercules had landed, the party really started with impressive tight formations and plenty of opposition work, with the picturesque Austrian mountains forming the perfect backdrop. Some even commented that the Typhoon pair were more impressive than the much loved displays of Ramex Delta! The other main set-piece at the show was the combat helicopter demonstration; which utilised no less than 15 helicopters! There were undoubtedly plenty of visitors in the audience humming along to Ride of the Valkyries as the six Bell 212 came in to land and dropped off troops on the airfield. However apart from the spectacle of such a large number of helicopters operating together, the demo was not as visually exciting as similar displays hosted elsewhere such as RNAS Yeovilton's Commando Assault. Simple alterations such as the realignment of the OH-58 Kiowas strafing passes to bring them closer to the crowd would have helped give the demonstration more appeal to the crowd. Likewise, the fast-roping from the UH-60 Blackhawks which was done on the far side of the airfield could have been more impressive had it been seen closer to the crowdline. Another key element of the flying programme for the Austrian Air Force was the inclusion of an 'Austrian Classic Jet Flypast', which consisted of an example of every jet-powered aircraft operated by the Austrian Air Force; (de Havilland Vampire, SAAB Tunnan, Fouga Magister, SAAB Draken, SAAB 105, F-5E Tiger II & Eurofighter Typhoon). The formation completed three simple passes before the SwAFHF Draken broke formation in spectacular fashion and performed a short solo display. Fans of display teams were well catered for at Airpower16, with a variety of teams filling the flying programme. 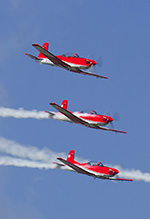 The show represented one of the last chances to see the legendary Freece Tricolori in their MB339PAN jets, as the team are due to be re-equipped with their new Alenia Aermacchi M-345 jets. The Italian team performed to their usual high standard, and it was obvious that they were a big hit with the Austrian crowd. A mention must be given to Patrulla Águila who should be commended for being the most improved display at the show for many observers. This year the team seemed to have sharpened their display up considerably to match the competition from other European teams. We would however be advocates for a shortening of their display time; 50 minutes is simply too long. Another clever initiative used by the Airpower organisers was creating a mini Tiger Meet at the air show, with 1JTS (Austrian SAAB 105 unit) hosting their NATO Tiger Association colleagues. This area of the static park included various aircraft featuring Tiger paint schemes including a German EF2000, Royal Navy Merlin HM2, Spanish EF-18A and Swiss Hunter. One complaint that we did have with the event (pretty much the only complaint) was the positioning of the static displays, with an age old battle that photographers face at countless events; the barriers being far too close to the aircraft. Even with a 10mm lens, photography of the majority of static display items was almost impossible which was a shame when it featured items such as an Austrian Alouette III in a new special paint scheme, Slovak Mil-17 Hip and German UH-1. One “interesting” aspect of the static display was the positioning, perhaps tactical, of the Luftwaffe's rather bright, 60 years special scheme EF2000, next to a plain grey Royal Air Force Typhoon FGR4. With the UK example totally devoid of markings (not even a tail code on this particular jet) it was a stark juxtaposition on the topic of marked/unmarked airframes. Of course the main attraction for most visitors was the brilliant line-up of quality display items from all across Europe in the air, in a flying display which lasted over 9 hours! Whilst there were far too many quality items for us to name them all, standout items for us included the French Air Force Rafale - without a doubt still the king of the European fast jet circuit, Slovenian PC-9M - an incredibly punchy display for the aircraft type, and Spanish EF-18A - for pulling some manoeuvres which the author has never seen performed in any jet aircraft previously. 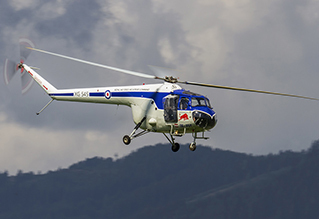 Of particular delight to the photographers present was the display of the Czech Air Force Mil-24 Hind, performing in-front of the Zeltweg Mountains. The machine doing the honours was '3370', in its commemorative RAF Liberator paint scheme playing homage to contributions made by Czechoslovakian airmen in WWII. On Saturday the Hind was one of the last items to perform, and it's stellar display in warm evening light was a sight to behold. Aside from the stand-out action in the skies, the thing that really set Airpower apart was its incredible Spotter's Package. The author opted for the full 5 day package, costing €200. This may sound expensive but it was actually incredible value when you break down the advantages. Firstly; all registered spotters got exclusive access to 14 photos spots across the airfield, many of which were outside the public areas and some of which were across the runway, under the flying display areas! Transport to/from these spots was provided by the Austrian Air Force in military vehicles and our hosts were always very accommodating to any demands. We even managed a quick stop at the line of parked helicopters on the live-side to get some unique images, nothing was too much trouble. Free food was also included in the package, all of which was provided by military chefs and of a high standard. Unsurprisingly there was plenty of free Red Bull too! All in all, Airpower16 met and exceeded all expectations. 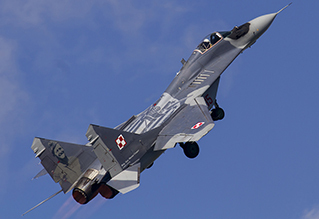 Even with the cancellations from the line-up, which included the Turkish Stars in the air and Portuguese F-16As on the ground, it is safe to say the show had one of the strongest flying display line-ups seen across Europe in 2016. When the show returns, most likely in 2019, we'll definitely be booking our return flights to Austria.